Sorry for not posting in a while, been busy with the end of the academic year and our annual Biology student camping trip. While I was pulling ticks in Kentucky though some very cool shark research was published, and I’ll try to catch up on those papers. This first article was of personal interest, as I was lucky enough to experience the incredible “afuera” whale shark aggregation last summer. In 2006, however, Rafa realized that whale sharks were also gathering further to the southeast, in an area that was outside of the Biosphere Reserve. Afuera means “outside” in Spanish, since the afuera aggregation is outside the protected area. As the authors report in de la Parra Venegas et al, aerial surveys over the aggregation documented astounding numbers of sharks during the 2006, 2008 and 2009 seasons, with numbers as high as 420 sharks counted during a single flight! None of the other known whale shark aggregations approach this number of animals. As surprising as the sheer number of whale sharks was the fact that the animals were there at all. Whale sharks are plankton feeders, and off Holbox are typically found in “green” (i.e. plankton rich) waters where they feed on copepods, small shrimp, etc. The afuera sharks were aggregating in “blue” water, however, which is low in plankton and therefore high in visibility -- blue. Rafa and his crew used plankton tows, dragging a sieving device behind a boat through the aggregation, to see what the sharks were eating. They found fish eggs by the millions, specifically the eggs of a small tuna called little tunny. Fish eggs are a rich nutrient source for planktivorous species, but their transparency means that they don’t give the distinctive turbidity of a plankton bloom. The ability to see whale sharks in blue water occurs in a few other places where they feed mainly on fish and/or coral spawn. Another question was whether the afuera sharks were the same as the Holbox sharks. Anecdotally, Holbox tour operators reported fewer sharks during aufera aggregation periods, but that didn't prove the animals were the same. Tagging sharks with visible tags is a low-yield endeavor; the tags quickly fall off or become fouled with algae and unreadable. The authors report that a small number of animals tagged at the Holbox site were later found in the afuera. So it seems that these same animals may show up in Holbox beginning in May, but then move ‘around the corner’ later in the summer as the tuna begin to spawn. I visited the afuera aggregation last summer, finding a dense group of 150-200 sharks even at the tail end of the season. Truly an amazing wildlife experience. And just to be a bit self-serving, anyone interested in experiencing the afuera themselves should look into the trip SRI is running later this summer (https://www.sharks.org/expeditions.html). de la Parra Venegas R, Hueter R, González Cano J, Tyminski J, Gregorio Remolina J, et al. 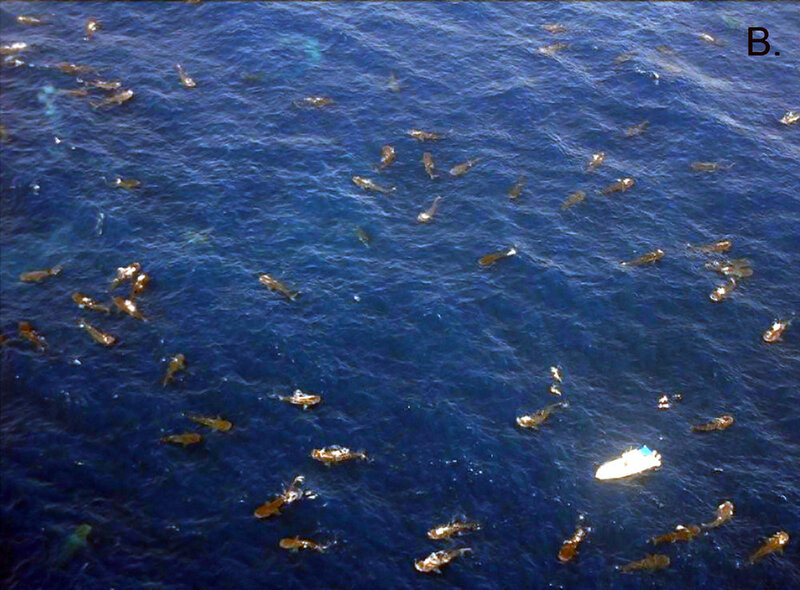 (2011) An Unprecedented Aggregation of Whale Sharks, Rhincodon typus, in Mexican Coastal Waters of the Caribbean Sea. PLoS ONE 6(4): e18994.